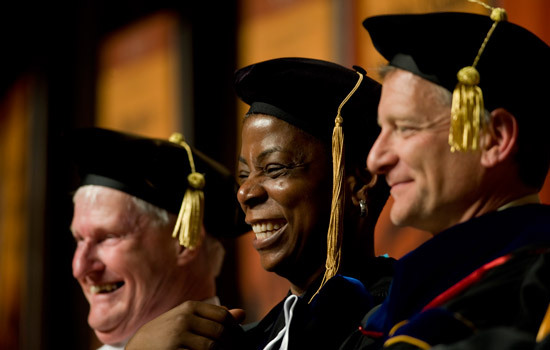 Ursula Burns, newly appointed CEO of Xerox Corp., presented the keynote address May 22 during RIT’s 124th annual commencement. Above, Burns shares the stage with RIT President Bill Destler (left) and Provost Jeremy Haefner, presiding over his first convocation ceremony as RIT provost. 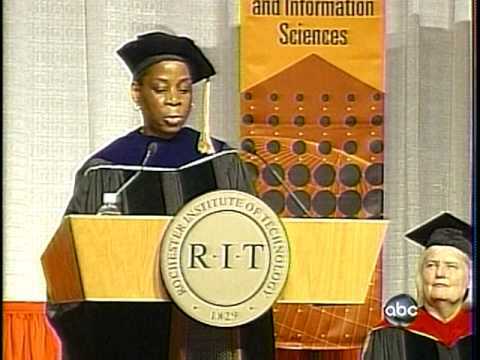 Ursula Burns, a veteran Xerox Corp. executive who will soon take over as the company’s chief executive officer, says she is proof that the United States is “the greatest country on earth.” She made that observation during an address to graduates at Rochester Institute of Technology on May 22. Burns served as the keynote speaker for RIT’s 124th annual commencement. Just one day prior, Xerox’s board of directors appointed her CEO to replace Anne Mulcahy, who will retire from that post effective July 1. Burns has served as president of the company for two years, and she told graduates that her success is reason for each of them to dream big. RIT conferred degrees on more than 3,500 undergraduate and graduate students during two days of commencement activities. In addition, the university marked a significant milestone by honoring the first graduates in its computing and information sciences doctoral program. Linwei Wang, from Hong Kong, and Erik Golen, from Dartmouth, Mass., received their doctorates during a graduation observance for RIT’s B. Thomas Golisano College of Computing and Information Sciences. RIT President Bill Destler awarded Burns an honorary doctor of humane letters degree at the ceremony. During his introduction, Destler commented on the important ties that bind her company with the university. Burns encouraged RIT graduates to set their sights on “changing the world” by taking up an important cause, helping to create good jobs for others, or simply raising a family that espouses good values.